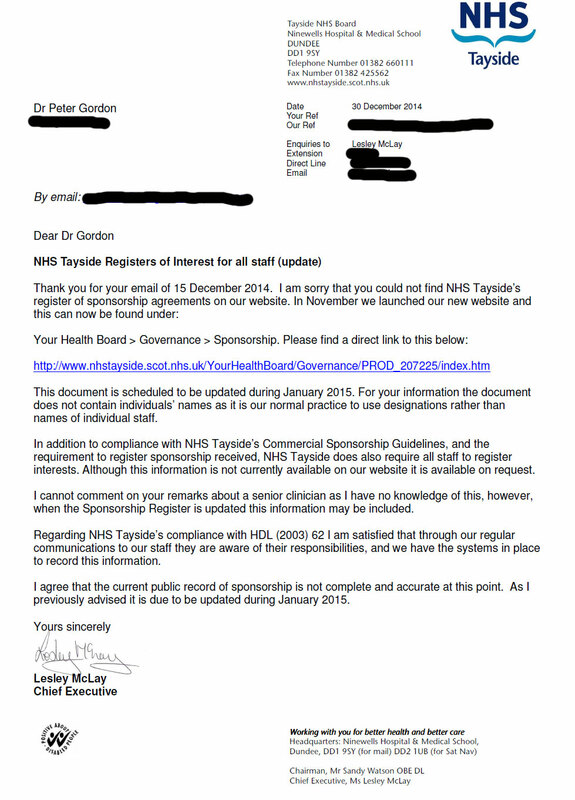 I am writing to seek further update on NHS Tayside’s compliance with HDL(2003)62. I am concerned that NHS Tayside do not seem to be fully complying with this Scottish Government Guidance. I shall briefly set out what NHS Tayside has confirmed on this matter. I first wrote to NHS Tayside about this in February 2013. This was part of writing to all 22 NHS Boards in Scotland. The “Public Record of Sponsorship” has 16 entries by individual employees of NHS Tayside (as some individuals have made several entries). 16 entries from 2011 to the end of 2013. This is a surprisingly small number. There were only two staff entries in 2012. (2) Your view as Chief Executive whether NHS Tayside’s “Public Record of Sponsorship” is a complete and accurate record of financial payments made to all employees of NHS Tayside? I would be grateful if you could provide me with the public link to NHS Tayside’s “Public Record of Sponsorship” for all staff. 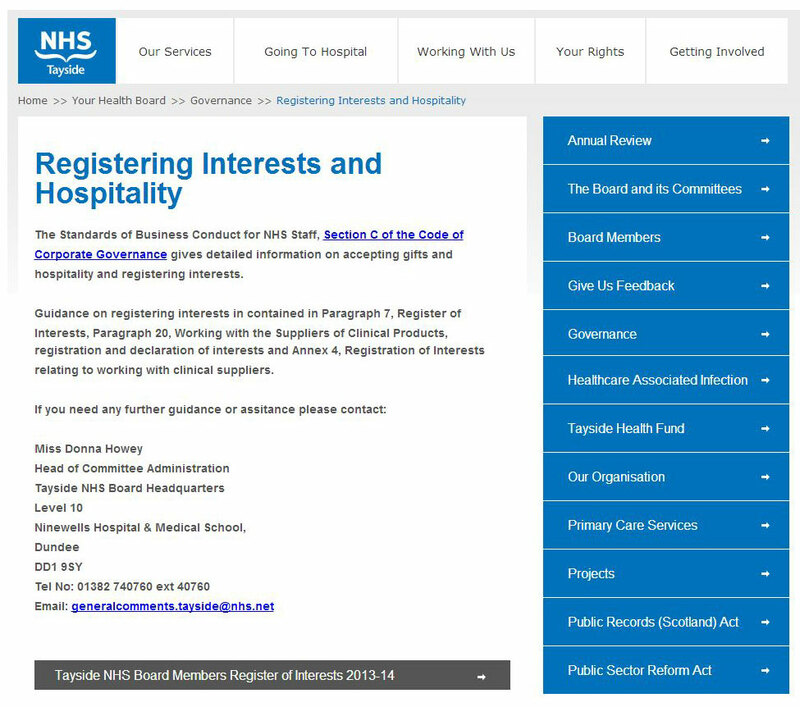 The public link to the NHS Tayside Register of Interests for all staff [as per above letter]. At the end of January I will follow Ms McLay’s guidance, and check if the register has been updated. Though it will be impossible to verify, that as a Register, if it will be “complete and accurate”. As it currently is, there are so few entries, that it seems unlikely that HDL 62 is being followed despite staff reminders. I have let Ms McLay know, by follow-up e-mail, that, to the best of my knowledge, no other Health Board in Scotland lists declarations by designation. Rather staff, in other NHS Health Boards, are listed by full name. I remain concerned about NHS Tayside’s commitment to transparency.